The magic lantern was invented at some point in the middle of the seventeenth century, probably by a Dutch scientist called Christiaan Huygens. However, because he did not think that his new invention was of much scientific interest, he did not publicise his work, and the creation of the magic lantern was often ascribed to other people. In particular, the German astronomer, Athanasius Kircher, was long associated with the instrument, mostly because his 1641 book on light and shadow (Ars Magna Lucis et Ombrae) contained the first published description of the magic lantern. The magic lantern is essentially the oldest form of slide projector. It consists of four basic parts. The first is a lightproof box which holds the light source. This was originally a candle or oil lamp, but later versions made use of limelight or even carbon arc electric lamps. At the front of the box, a condensing lens focuses the rays from the light source onto a slide. This slide carries the image to be projected and was the third part of the mechanism. The final part is a second lens, set in front of the slide, which ensures that a sharp version of the slide image appears on the screen. Screens were generally provided by sheets or white walls. Early magic lanterns were commonly used in homes, but by the end of the 18th Century a special form of lantern show had developed. It was known as the ‘phantasmagoria’ (meaning collection of phantoms) and was made up of images of ghosts, skeletons and goblins. The picture on the left shows a slide of a female ghost being projected for an audience. The lantern is set on a trolley so that it can be moved towards and away from the screen, making the picture of the ghost larger and smaller. The images were combined with sound effects of thunderclaps and explosions, and dry ice was used to create a smoky atmosphere. The ghost show that was produced thrilled or terrified audiences, forming a kind of precursor to today’s horror films. It was these shows that gave the magic lantern its name – before then it had been known as the ‘optical lantern’. The phantasmagoria only remained popular until the beginning of the nineteenth century. The most common way to see a lantern show in the early nineteenth century was one put on by a travelling lanternist. The magic lantern was a popular tool for travelling showmen during the eighteenth century. Many pictures and statues survive showing a man with his lantern strapped to his back, walking from village to village. They normally carried a small selection of slides, which they would use as the basis for telling stories and for bringing news about the wider world. Lanternists often carried musical instruments as well (in the pictures here you can see a drum and a hurdy gurdy), which they used to provide sound effects for their shows, and also to announce their arrival in the village. The age of the travelling lanternist ended when toy shops began to sell comparatively cheap lanterns for use in the home. What kind of slides did these lanternists show? The oldest lantern slides were painted by hand onto pieces of glass set into a wooden frame. At first they were simply black images, but soon colour was added to make them more interesting. Long slides with many images were common, like the one shown above, or, later, mahogany slides with a series of separate images set into them, like the one below. All of these slides have a single fixed images on them. However, slide makers also came up with ingenious ways of creating movement on the screen. The easiest way to create movement in a lantern slide is to use two pieces of glass, with one that can be pushed backwards and forwards behind the other, like the one shown below. They are known as ‘slipping slides’. The moving slide has patches of black paint to cover up the monkey’s original arm, and the head and bonnet of the woman, while revealing the image of the monkey holding the bonnet and the bald head of the woman. Here are two more slipping slides, one of them an educational slide, for showing the phases of the moon. If two moving pieces of glass are used, instead of one, a much more complex series of movements can be created. This image of a man swallowing a rat was very popular throughout the nineteenth century. This version of it uses two glass slides, one to open and close the man’s mouth, the other to move the rat forwards. Another option was to use a rotating disc behind the main image, which would carry the rat up the side of the bed and into the man’s mouth. This rotating image is made by having a disc of glass which is rotated by a handle behind the main picture, so that it creates an effect like a kaleidoscope. Other rotating slides made water wheels or windmills turn, as the handle went round. Now for one final form of slide movement – the dissolve effect. Dissolve effects are created by using two or more fixed slides, set in either two lanterns or a single lantern which has two projectors mounted in it (like the picture here). The light is adjusted slowly that the first slide to be lit is gradually faded out, while the second slide is made brighter. You can use this method to turn day to night, summer to winter, or even set a town on fire, as in the slides shown below. All of the slides you have seen so far were hand-painted on the glass. However, by the end of the nineteenth century, it was very common to find slides with photographic images. Photography was developed in the middle of the nineteenth century, and one of its earliest uses was in producing lantern slides of real places and people. Slides often showed interesting buildings or natural features. It is also common to find photographs taken by amateur photographers showing their families, homes or holiday travels, just like the photographic slides that we can take today. These images were always in black and white, because there was no colour film. Another sort of photographic slide that was common was the ‘life model’ slide. These slides were illustrations that were used to accompany stories told by the lanternist. The slides were created by photographing people posed to represent a scene in the story. The images were often hand-coloured after they had been printed, to give a more realistic effect. The one shown here is a scene from the popular story, ‘Jessica’s first prayer’. Slides like these were the mainstay of the lantern show at the end of the nineteenth century. With dissolve effects, clever lighting and sound effects, the lantern show had become a very sophisticated affair. But what happened once films came along? Very few people know that the very first time that films were projected, a magic lantern was used as the projector. So the cinema didn’t automatically replace the magic lantern. The picture here shows a lantern being used to project a film. When film projectors replaced the lanterns, you would still find a lantern being used in a cinema. They showed the still advertisements before the film, gave information on forthcoming programmes, and were also used to put up words for songs, which were sung to the accompaniment of the cinema organ. 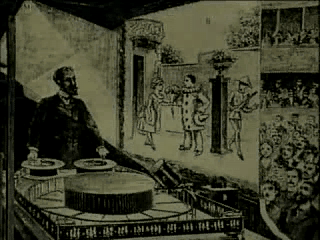 Magic lantern shows continued to happen in village halls, particularly as entertainments for children, and there are lots of people still around who can remember them. Try asking your oldest relatives and see what they remember. Lanterns were also used for teaching, until the electric slide projector was developed in the 1950s. Nowadays, lantern shows are becoming popular again, and there is even a society devoted to the magic lantern. You can visit its website at magiclantern.org.uk. You can find out lots more about magic lanterns and lantern slides at The Victorian Magic Lantern, at MOMI-online and at this Dutch Magic Lantern Site. For other uses, see VJ (disambiguation). One of the key elements in the practice of VJing is the realtime mix of content from a “library of media”, on storage media such as VHS tapes or DVD disks, video and still image files on computer hard drives, live camera input, or from a computer generated visuals. In addition to the selection of media, VJing mostly implies realtime processing of the visual material. The term is also used to describe the performative use of generative software, although the word “becomes dubious (…) since no video is being mixed”. Historically, VJing gets its references from art forms that deal with the synesthetic experience of vision and sound. These historical references are shared with other live audiovisual art forms, such as Live Cinema, to include the camera obscura, the panorama and diorama, the magic lantern, color organ, and liquid light shows. In clubs and private events in the 1960s “people used liquid-slides, disco balls and light projections on smoke to give the audience new sensations. Some of these experiments were linked to the music, but most of the time they functioned as decorations.” These came to be known as liquid light shows. From 1965 to 1966 in San Francisco, the visual shows by artist collectives such as The Joshua Light Show and the Brotherhood of Light accompanied The Grateful Dead concerts, which were inspired by the Beat generation–in particular the Merry Pranksters–and fueled by the “expansion of consciousness” from the Acid Tests. During late 70’s video and music performance became more tightly integrated. At concerts, a few bands started to have regular film/video along with their music. Experimental film maker Tony Potts was considered an unofficial member of The Monochrome Set for his work on lighting design and film making for projections for live shows. Test Department initially worked with “Bert” Turnball as their resident visual artist, creating slideshows and film for live performances. The organization, Ministry of Power included collaborations with performance groups, traditional choirs and various political activists. Industrial bands would perform in art contexts, as well as in concert halls, and often with video projections. Groups like Cabaret Voltaire started to use low cost video editing equipment to create their own time-based collages for their sound works. In their words, “before [the use of video], you had to do collages on paper, but now you present them in rhythm—living time—in video.” The film collages made by and for groups such as the Test Dept, Throbbing Gristle and San Francisco’s Tuxedomoon became part of their live shows. An example of mixing film with live performance is that of Public Image Ltd. at the Ritz Riot in 1981. This club, located on the East 9th St in New York, had a state of the art video projection system. It was used to show a combination of prerecorded and live video on the club’s screen. PiL played behind this screen with lights rear projecting their shadows on to the screen. Expecting a more traditional rock show, the audience reacted by pelting the projection screen with beer bottles and eventually pulling down the screen. With the advent of the first audio synthesizers built by Bell Labs in the ’70s, image synthesizing was not far behind. An artist retreat in Owego New York called Experimental Television Center, founded in 1971, made contributions to the development of many artists by gathering the experimental hardware created by video art pioneers: Nam June Paik, Steve Rutt and Bill Etra, and made the equipment available to artists in an inviting setting for free experimentation. Many of the outcomes debuted at the nightclub Hurrah which quickly became a new alternative for video artists who could not get their avant garde productions aired on regular broadcast outlets. Similarly, music video development was happening in other major cities around the world, providing an alternative to mainstream television. A notable image processor is the Sandin Image Processor (1971), primarily as it describes what is now commonly referred to as open source. The rise of electronic music (especially in house and techno genres) and DJ club culture provided more opportunities for artists to create live visuals at events. The popularity of MTV lead to greater and better production of music videos for both broadcast and VHS, and many clubs began to show music videos as part of entertainment and atmosphere. Joe Shannahan (owner of Metro in 1989-1990) was paying artists for video content on VHS. Part of the evening they would play MTV music videos and part of the evening they would run mixes from local artists Shanahan had commissioned. Medusa’s (an all-ages bar in Chicago) incorporated visuals as part of their nightly art performances throughout the early to mid 80s (1983–85). Also in Chicago during the mid-80s was Smart Bar, where Metro held “Video Metro” every Saturday night. In the 1980s the development of relatively cheap transistor and integrated circuit technology allowed the development of digital video effects hardware at a price within reach of individual VJs and nightclub owners. One of the first commercially distributed video synthesizers available in 1981 was the CEL Electronics Chromascope sold for use in the developing nightclub scene. The Fairlight Computer Video Instrument (CVI), first produced in 1983, was revolutionary in this area, allowing complex digital effects to be applied in real time to video sources. The CVI became popular amongst television and music video producers and features in a number of music videos from the period. The Commodore Amiga introduced in 1985 made a breakthrough in accessibility for home computers and developed the first computer animation programs for 2D and 3D animation that could produce broadcast results on a desktop computer. A number of recorded works begin to be published in the 1990s to further distribute the work of VJs, such as the Xmix compilations (beginning in 1993), Future Sound of London‘s “Lifeforms”(VHS, 1994), Emergency Broadcast Network‘s “Telecommunication Breakdown” (VHS, 1995), Coldcut and Hexstatic‘s “Timber” (VHS, 1997 and then later on CDRom including a copy of VJamm VJ software), and “The Mego Videos” compilation of works from 1996-1998 (VHS/PAL, 1999). Also of note is the CD release of Jean Michel Jarre “Odyssey Through O2” that came with a copy of the ArKaos software (1998). In the United States, the emergence of the rave scene is perhaps to be credited for the shift of the VJ scene from nightclubs into underground parties. From around 1991 until 1994, Mark Zero would do film loops at Chicago raves and house parties. One of the earliest large-scale Chicago raves was “Massive New Years Eve Revolution” in 1993, produced by Milwaukee’s Drop Bass Network. It was a notable event as it featured the Optique Vid Tek (OVT) VJs on the bill. This event was followed by Psychosis, held on 3 April 1993, and headlined by Psychic TV, with visuals by OVT. In San Francisco Dimension 7 were a VJ collective working the early West Coast rave scene beginning in 1993. Between 1996 and 1998, Dimension 7 took projectors and lasers to the Burningman festival, creating immersive video installations on the Black Rock desert. 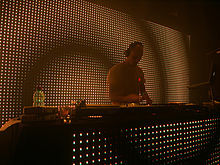 In the UK groups such as The Light Surgeons were transforming clubs and rave events by combining the old techniques of liquid lightshows with layers of slide, film and video projections. Another collective, “Hex” were working across a wide range of media – from computer games to art exhibitions – the group pioneered many new media hybrids, including live audiovisual jamming, computer-generated audio performances, and interactive collaborative instruments. This was the start of a trend which continues today with many VJs working beyond the club and dance party scene in areas such as installation art. The Japanese book “VJ2000” (Daizaburo Harada, 1999) marked one of the earliest publications dedicated to discussing the practices of VJs. The combination of the emerging rave scene, along with slightly more affordable video technology for home-entertainment systems, brought consumer products to become more widely used in artistic production. However, costs for these new types of video equipment were still high enough to be prohibitive for many artists. As a result of these, the VJ scene saw an explosion of new artists and styles. These conditions also facilitated a sudden emergence of a less visible (but nonetheless strong) movement of artists who were creating algorithmic, generative visuals. This decade saw video technology shift from being strictly for professional film and television studios to being accessible for the prosumer market (e.g. the wedding industry, church presentations, low-budget films, and community television productions). These mixers were quickly adopted by VJs as the core component of their performance setups. This is similar to the release of the Technics 1200 turntables, which were marketed towards homeowners desiring a more advanced home entertainment system, but were then appropriated by musicians and music enthusiasts for experimentation. Initially, video mixers were used to mix pre-prepared video material from VHSplayers and live camera sources, and later to add the new computer software outputs into their mix. The 90s saw the development of a number of digital video mixers such as Panasonic’s WJ-MX50, WJ-MX12, and the Videonics MX-1. In 1998, Roland / Edirol released the V5 Video Canvas, which was a hybrid device featuring solid state storage of still images combined with a basic video mixer. The V5 marked an important transition point, where large music corporations saw an emerging market for video performance hardware. The products that followed the V5 have become the mainstay of VJ hardware setups. Early desktop editing systems such as the NewTek Video Toaster for the Amiga computer were quickly put to use by VJs seeking to create visuals for the emerging rave scene, whilst software developers began to develop systems specifically designed for live visuals such as O’Wonder’s “Bitbopper”. 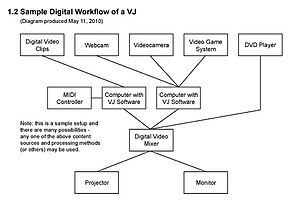 The first known software for VJs was Vujak – created in 1992 and written for the Mac by EBN artist Brian Kane for use by the video art group he was part of – Emergency Broadcast Network. By the late 90s there were several PC based VJing software available, including generative visuals programs such as MooNSTER, Aestesis, and Advanced Visualization Studio, as well as video clip players such as Motion Dive, ArKaos, and VJamm. Programming environments such as Max/MSP, Macromedia Director and later Quartz Composer started to become used by themselves and also to create VJing programs like VDMX. These new software products and the dramatic increases in computer processing power over the decade meant that VJs were now regularly taking computers to gigs. The new century has brought new dynamics to the practice of visual performance. To be a VJ previously had largely meant a process of self-invention in isolation from others: the term wasn’t widely known. Then through the rise of internet adoption, having access to other practitioners very became the norm, and virtual communities quickly formed. The sense of collective then translated from the virtual world onto physical spaces. This becomes apparent through the numerous festivals that emerge all over Europe with strong focus on VJing. The VideA festival in Barcelona ran from 2000 – 2005., AVIT, clear in its inception as the online community of VJCentral.com self-organising a physical presence, had its first festival in Leeds (2002), followed by Chicago (2003), Brighton (2003), San Francisco (2004), and Birmingham (2005), 320×240 in Croatia (2003), Contact Europe in Berlin (2003). Also the Cimatics festival in Brussels should be credited as a pioneering event, with a first festival edition in 2002 completely dedicated to VJing. 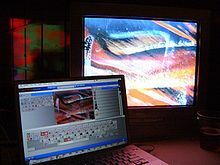 In 2003, the Finnish media arts festival PixelAche was dedicated to the topic of VJing, while in 2003, Berlin’s Chaos Computer Club started a collaboration with AVIT organisers that featured VJ Camps and Congress strands. 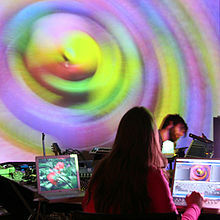 The MUTEK festival (2000–present) in Montréal regularly featured VJs alongside experimental sound art performances, and later the Elektra Festival (2008–present) also emerged in Montréal and featured many VJ performances. In Perth, Australia, the Byte Me! festival (2009) showed the work of many VJs from the Pacific Rim area alongside new media theorists and design practitioners. Two festivals entirely dedicated to VJing, Mapping Festival in Geneva and Vision’R in Paris, held their first edition in 2005. As these festivals emerged that prominently featured VJs as headline acts (or the entire focus of the festival), the rave festival scene also began to regularly include VJs in their main stage lineups with varying degrees of prominence. With lesser funding, the US scene has been host to more workshops and salons than festivals. Between 2000-2006, Grant Davis (VJ Culture) and Jon Schwark of Dimension 7 produced “Video Salon”, a regular monthly gathering significant in helping establish and educate a strong VJ community in San Francisco, and attended by VJs across California and the United States. In addition, they produced an annual “Video RIOT!” (2003–2005) as a political statement following the R.A.V.E. Act (Reducing Americans’ Vulnerability to Ecstasy Act) of 2003; a display of dissatisfaction by the re-election of George W. Bush in 2004; and in defiance of a San Francisco city ordinance limiting public gatherings in 2005. Several VJ battles and competitions began to emerge during this time period, such as Video Salon’s “SIGGRAPH VJ Battle” in San Diego (2003), Videocake’s “AV Deathmatch” series in Toronto (2006) and the “VJ Contests” at the Mapping Festival in Geneva (2009). These worked much like a traditional DJ battle where VJs would be given a set amount of time to show off their best mixes and were judged according to several criteria by a panel of judges. A VJ preparing a new source to be mixed into the one being projected. Databases of visual content and promotional documentation became available on DVD formats and online through personal websites and through large databases, such as the “Prelinger Archives” on Archive.org. Many VJs began releasing digital video loop sets on various websites under Public Domain or Creative Commons licensing for other VJs to use in their mixes, such as Tom Bassford’s “Design of Signage” collection (2006), Analog Recycling’s “79 VJ Loops” (2006), and VJzoo’s “Vintage Fairlight Clips” (2007). Promotional and content based DVDs began to emerge, such as the works by Mixmasters (2000–2005), Lightrhythm Visuals (2003), Visomat Inc. (2002), and Pixdisc, all of which focused on the visual creators, VJ styles and techniques. These were then later followed by NOTV, Atmospherix, and other labels. Mia Makela curated a DVD for Mediateca of Caixa Forum called “LIVE CINEMA” in 2007, focusing on the emerging sister practice of “live cinema”. Individual VJs and collectives also published DVDs and CD-ROMs of their work, including Eclectic Method’s bootleg video mix (2002) and Eclectic Method’s “We’re Not VJs” (2005), as well as eyewash’s “DVD2” (2004) and their “DVD3” (2008). Books reflecting on the history, technical aspects, and theoretical issues began to appear, such as “VJ: Audio-Visual Art and VJ Culture” (Michael Faulkner and D-Fuse, 2006), “vE-jA: Art + Technology of Live Audio-Video” (Xárene Eskandar [ed], 2006), and “VJ: Live Cinema Unraveled” (Tim Jaeger, 2006). The subject of VJ-DJ collaboration also started to become a subject of interest for those studying in the field of academic human–computer interaction (HCI). 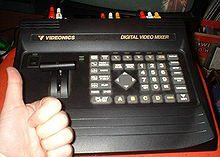 The Edirol V-4 video mixer. The availability and affordability of new consumer-level technology allowed many more people to get involved into VJing. The dramatic increase in computer processing power that became available facilitated more compact, yet often more complex setups, sometimes allowing VJs to bypass using a video mixer, using powerful computers running VJ software to control their mixing instead. However, many VJs continue to use video mixers with multiple sources, which allows flexibility for a wide range of input devices and a level of security against computer crashes or slowdowns in video playback due to overloading the CPU of computers due to the demanding nature of realtime video processing. In 2001, Roland / Edirol released the V4 Video mixer, a popular video mixer designed specifically for VJing. It features MIDI control to enable integration with digital music equipment, and quickly became adopted as a standard VJ mixer. Other companies (Korg and Pioneer, for example), following the success of the V4, launched visual mixers as well. The Edirol V8 came out in 2008. An example of some VJ software, a preview monitor, and the resultant projection. Today’s VJs have a wide choice of off the shelf hardware products, covering every aspect of visuals performance, including video sample playback (Korg Kaptivator), real-time video effects (Korg Entrancer) and 3D visual generation (Edirol CG8). The widespread use of DVDs gave initiative for scratchable DVD players (Pioneer DVJ-X1 and Pioneer DVJ-1000). 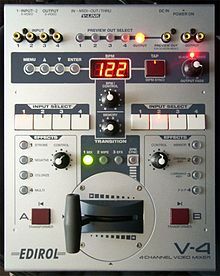 Many new models of MIDI controllers became available during the 2000s, which allow VJs to use controllers based on physical knobs, dials, and sliders, rather than interact primarily with the mouse/keyboard computer interface. There are also many VJs working with experimental approaches to working with live video. Open source graphical programming environments (such as Pure Data) are often used to create custom software interfaces for performances, or to connect experimental devices to their computer for processing live data (for example, the IBVA EEG-reading brainwave unit, the Arduino microprocessor, or circuit bending children’s toys). The second half of this decade also saw a dramatic increase in display configurations being deployed, including widescreen canvases, multiple projections and video mapped onto the architectural form. This shift has been underlined by the transition from broadcast based technology – fixed until this decade firmly in the 4×3 aspect ratio specifications NTSC and PAL – to computer industry technology, where the varied needs of office presentation, immersive gaming and corporate video presentation have led to diversity and abundance in methods of output. Compared to the ~640x480i fixed format of NTSC/PAL, a contemporary laptop using DVI can output a great variety of resolutions up to ~2500px wide, and in conjunction with the Matrox TripleHead2Go can feed three different displays with an image coordinated across them all. A significant aspect of VJing is the use of technology, be it the re-appropriation of existing technologies meant for other fields, or the creation of new and specific ones for the purpose of live performance. 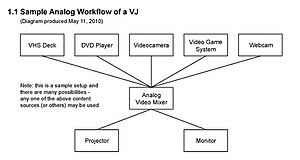 The advent of video is a defining moment for the formation of the VJ (video jockey). Often using a video mixer, VJs blend and superimpose various video sources into a live motion composition. In recent years, electronic musical instrument makers have begun to make specialty equipment for VJing. VJing developed initially by performers using video hardware such as videocameras, video decks and monitors to transmit improvised performances with live input from cameras and even broadcast TV mixed with pre-recorded elements. This tradition lives on with many VJs using a wide range of hardware and software available commercially or custom made for and by the VJs. Source hardware generates a video picture which can be manipulated by the VJ, e.g. video cameras and Video Synthesizers. Playback hardware plays back an existing video stream from disk or tape based storage mediums, e.g. VHS tape players and DVD players. Mixing hardware allows the combining of multiple streams of video e.g. a Video Mixer or a computer utilizing VJ software. Output hardware is for displaying the video signal, e.g. Video projector, LED display, or Plasma Screen. There are many types of software a VJ may use in their work, traditional NLE production tools such as Adobe Premiere, After Effects, and Apple’s Final Cut Pro are used to create content for VJ shows. Specialist performance software is used by VJs to playback and manipulate video in realtime. VJ performance software is highly diverse, many applications are developed by VJs themselves specifically to suit their own performance style. Graphical programming environments such as Max/MSP/Jitter, vvvv, Isadora and Pure Data have developed to facilitate rapid development of such custom software without needing years of coding experience. Small companies producing dedicated VJ software such as Modul8, Resolume, VJamm, VDMX, Livid CellDNA or Grand VJ/ArKaos give VJs a sophisticated interface for realtime processing of multiple layers of video clips combined with live camera inputs, giving VJs a complete off the shelf solution so they can simply load in the content and perform. An opensource video effects plugin architecture called Freeframe has been developed to allow sharing of realtime video effects plugins between VJ softwares. There are many types of configurations of hardware and software that a VJ may use to perform. 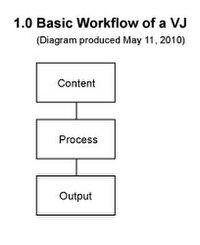 This image shows the basic conceptual workflow for a VJ. This image shows a sample setup of how a VJ may set up an analog VJ workflow. This image shows a sample setup of how a VJ may set up a digital VJ workflow. Several research projects have been dedicated to the documentation and study of VJing from the reflective and theoretical point of view. In the Netherlands Media Art Institute, Montevideo / Time Based Arts, Annet Dekker organized a research on the subject called VJ Cultuur – a state of flux. Dekker wrote widely on the history of VJing and its contextualization within the club culture. In the same year, 2005, VJ Theory  began publishing texts written by practitioners and academics, and organizing collective discussions online and offline around subjects related to VJing and audiovisual performative practices. Between 2005 and 2006 several books were published with interviews, showcasing works and related artists, providing an overview of the current practice. Round tables, talks, presentations and discussions are part of festivals and conferences related to new media art, such as ISEA and Ars Electronica for example, as well as specifically related to VJing, as is the case of the Mapping Festival. Exchange of ideas through dialogue contributed to the shift of the discussion from issues related to the practicalities of production to more complex ideas and to the process and the concept. Subjects related to VJing are, but not exclusively: identity and persona (individual and collective), the moment as art, audience participation, authorship, networks, collaboration and narrative. Through collaborative projects, visual live performance shift to a field of interdisciplinary practices. Periodical publications, online and printed, launched special issues on VJing. This is the case of AMinima printed magazine, with a special issue on Live Cinema  (which features works by VJs), and Vague Terrain (an online new media journal), with the issue The Rise of the VJ. ^ “VJ: an artist who creates and mixes video live and in synchronization to music”. – Eskandar, p.1. ^ Betancourt, Michael (May 2008). “Pushing the Performance Envelope”. MAKE 14 (1556-2336): 47. ^ Interview with Brien Rullman of OVT. ^ Interview with Grant Davis aka VJ Culture specifically about the San Francisco scene. ^ Sound on Sound – The History of Roland. Retrieved August 18, 2006. ^ “VJCultuur, a state of flux”. 2004/2005. http://www.vjcultuur.nl. Retrieved 12 May 2010. ^ “VJ Theory”. 2005. http://www.vjtheory.net. Retrieved 12 May 2010. ^ These include The VJ Book: Inspirations and practical Advice for Live Visuals Performance by Paul Spinrad, VJ: Audio-Visual Art and VJ Culture edited by D-Fuse, vE-jA: Art + Technology of Live Audio-Video edited by Xárene Eskandar. For more details please check the bibliography. ^ Gates (ed. ), Carrie (March 2008). “The Rise of the VJ”. Vague Terrain (9). http://vagueterrain.net/journal09. Retrieved 12 May 2010.